We follow the sirens and cars onto the property of that huge star. Around the property, ever so slowly until we see the body. Floating, face down in the pool – Joe Gillis. Undoubtedly, one of the most memorable opening sequences in film history. 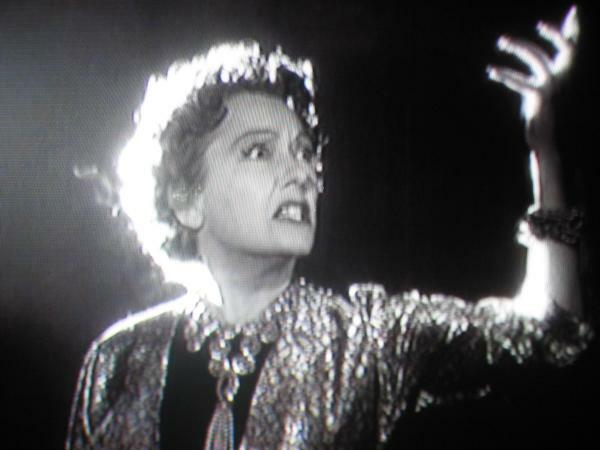 Outstanding enough, in my opinion to render Sunset Boulevard unforgettable on its merits alone. The pool shot is stirring, striking. 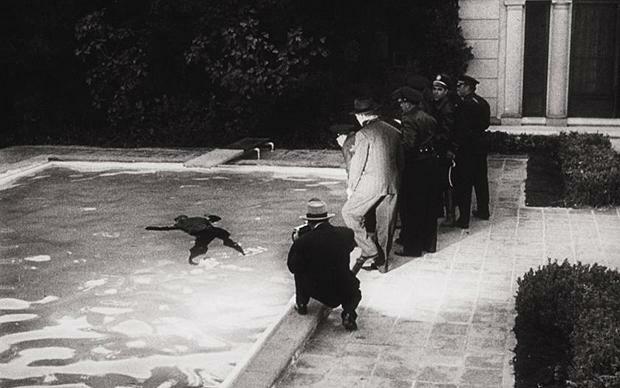 In the 2006 Volker Schlöndorff documentary, Billy Wilder Speaks, Wilder himself describes the famous opening shot of Joe Gillis dead in the pool, detailing how much time and effort it took to get the perfect shot, the perfect image from the perfect perspective, a fish’. What worked was simply placing a mirror at the bottom of the pool and shooting the reflection off of that. With a simple reflection off a mirror starts one of the greatest motion pictures ever made, one that is big. 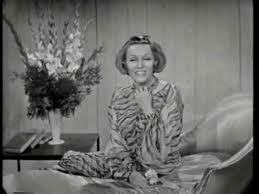 As soon as I completed entries for a previous blogathon I started watching clips of Gloria Swanson interviews. My intention was to watch one, get a sense of what she sounded like in real life since it’d been years since I heard her voice outside of Sunset Blvd. Before I knew it I’d watched as many as I could find, fascinated by stories of her career, working with Cecil B. DeMille, the silent era in pictures, you name it. She was very funny, a great storyteller. 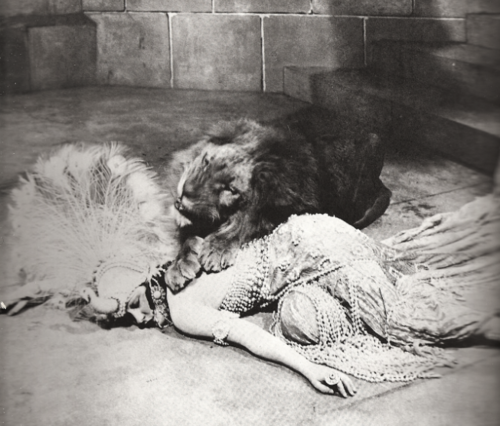 During one particular interview I found interesting she talks about her 1919 film, directed by Cecil B. DeMille, Male and Female and discusses the scene in which she shares the screen with a lion, a scene, incidentally she was very proud of because she pleaded with DeMille not to omit it from the film, which he considered doing. She remembered lying still with the lion’s paws resting on her bare back, its hot breath on her neck and remembers she’d get goosebumps on goosebumps whenever the animal roared. No doubt a dangerous scene to shoot. So, film completed, proud of her work, Swanson sat in the darkened theater at the film’s premier only to have a man behind her say, as he looked at her with the lion, “I wonder which one of two is stuffed.” Oh, the cruelty of stardom! Someone should make a film about that. Fast forward thirty years or so and the great Swanson, now well past her prime as far as her career goes, is starring in Sunset Blvd. directed by the now legendary, Billy Wilder. How she ended up in the role, one I thought was written for her, is interesting. As comes to light in the Schlöndorff documentary, the director originally wanted Mae West for the part but she passed on the role. Wilder also approached Mary Pickford, Paramount’s first big star, “America’s Sweetheart” but Ms. Pickford always owned her own film negatives, which was not an option in this case so she was out of the running immediately. Stage and screen actress, Pola Negri was also considered. But it wasn’t until Wilder and director, George Cukor were having tea one day when Wilder expressed his dilemma and Cukor suggested Gloria Swanson. Billy Wilder loved the idea immediately but still asked Swanson to audition for the part, something not easily done to a star of her stature, even if her stature had greatly diminished by 1950. Ultimately, Swanson was perfect for the part, as Wilder admits, because of her style of acting. “Period acting,” as he calls it, from the silent era, a style no one else could have learned so well. Although, he admits, it was a risk. The “exaggerated” style of acting from the silent era could have easily gone over the top, become the ridiculous. 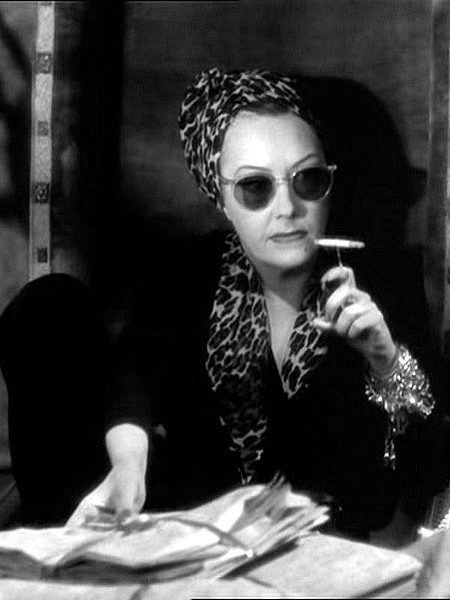 As he describes it, the danger of going too far is like “a beautiful woman bordering on being ugly.” I think Gloria Swanson is brilliant as Norma Desmond – one of the most iconic characters and performances in cinema. I have to admit it took me some time to figure out what, specifically, about Sunset Boulevard to focus on in this piece and I’m not sure I succeed in focusing on one theme. The film is so magnificent, endlessly fascinating to me, making it difficult to find one aspect of the film to bring attention to. I can’t fathom a classic film fan or a fan of classic Hollywood in general has not seen this film. It is the quintessential film about Hollywood, portraying the worst of it. It’s not a pretty story. In essence its theme is about selling out or the corruption inherent in Hollywood, about exploitation. You have a has-been megastar of the silent era in Norma Desmond (Swanson), who is “still waving proudly at a parade which had long since passed her by.” Swanson’s Desmond is a pathetic recluse surrounded by images of herself in her former glory who still believes her adoring public is waiting for her return. Her home is a gothic mansion, an extension of her, it too had seen better days. She lives there with her devoted butler and ex-husband, Max who also used to be her director. 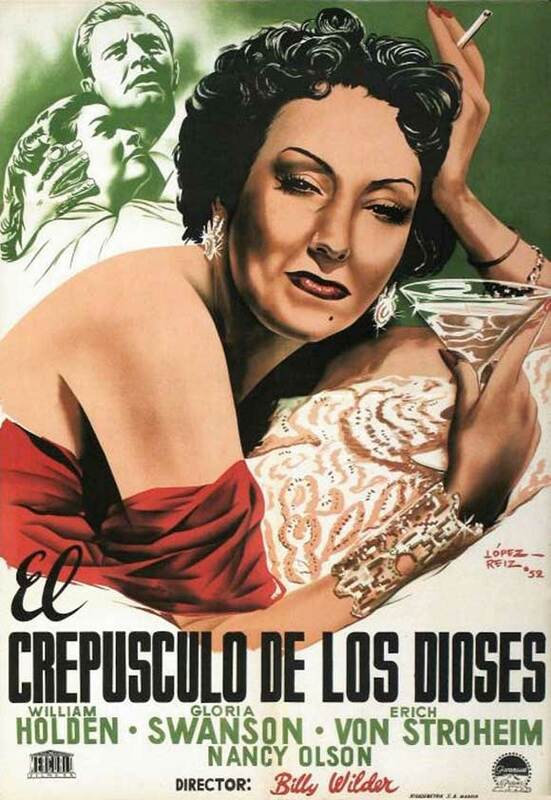 A strikingly odd figure from the moment we see her on-screen, Norma Desmond is also quite magnificent. The outfits (by Edith Head), the make-up, the face, the eyes. I can’t take my eyes off her. We meet her as Joe Gillis does, as he happened into her house quite by accident. For the role of Joe Gillis, Wilder had Montgomery Clift in mind from the very start. Clift passed on the part only a couple of weeks prior to shooting. 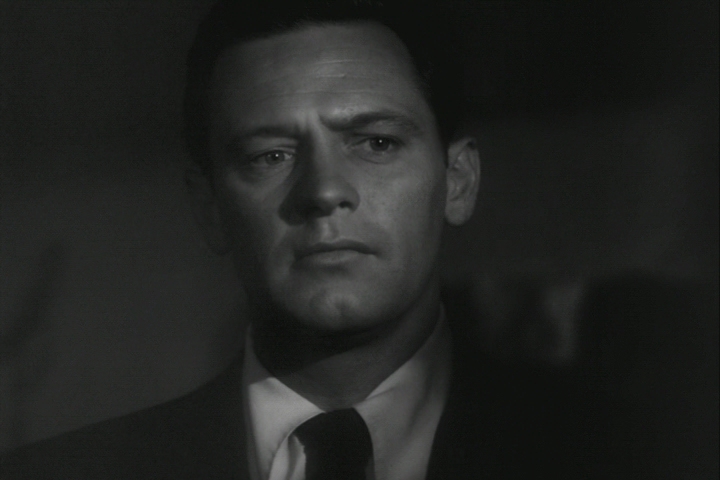 His agents advised the studio that Clift felt the role would “ruin his reputation in Hollywood.” William Holden, who hadn’t had a hit in Hollywood for a decade, since Rouben Mamoulian’s, Golden Boy (1939), was not well-known, little more than a contract player at Paramount. Something I have a hard time believing because he’s so handsome, movie-star material for sure. He would become, after Sunset Blvd., one of Billy Wilder’s favorite actors. 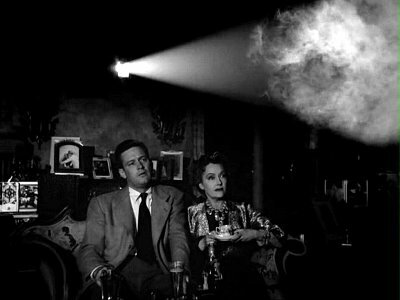 Upon accepting the role, William Holden stepped in and made Joe Gillis his own, stating when he read the script that he “had to do it.” He is great as the down-on-his-luck writer desperate for a break and an income who stumbles into the mansion (and life) of faded film star, Norma Desmond. Unable to sell any of his screenplays, Gillis accepts a job as editor to the screenplay of Salome that Norma Desmond has written as a vehicle for her return to stardom. Desmond is soon obsessed with Joe Gillis and he is engulfed into her world. He becomes her employee and her lover. A kept man – he sells his soul. We know from the beginning this doesn’t end well for him – first he loses all self-respect, in the end he loses his life and she, what was left of her sanity. Talk about perfect casting, Erich von Stroheim as Max Von Mayerling, Norma Desmond’s devoted butler, ex-husband and ex-director. 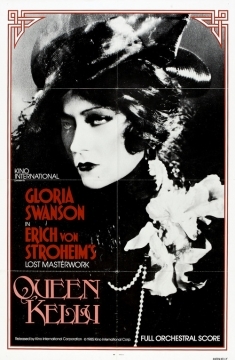 von Stroheim was a great director of the silent film era who’d directed Gloria Swanson in what would be the film that played a huge part in virtually ending both of their careers in film (but more on that in a bit). These types of planned “coincidences” are part of what make Sunset Blvd. so iconic, a film that is as woven into the fabric of authentic Hollywood history as any other I can think of. 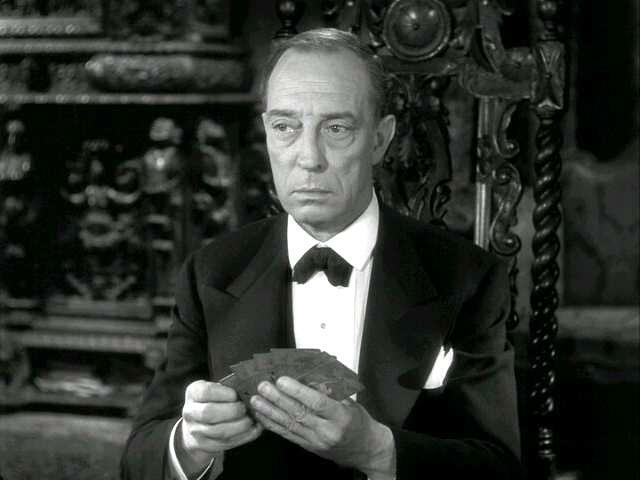 Anyway, as is the case with Swanson, in von Stroheim we get an actor who knows exactly what his character is witnessing because he’s actually been there. The fact that he plays a ruined film director who ends up being the star’s butler is in some ways an accurate depiction of von Stroheim’s career. Also, worthy of note is Nancy Olson in her third film appearance. She plays Betty Shaefer, a writer under contract at Paramount who Joe Gillis falls for. She and Joe are able to forge a relationship when he is able to escape the grip of Norma Desmond. Olson’s great in the part, the fresh face Billy Wilder wanted adds a great contrast to Desmond and her world. 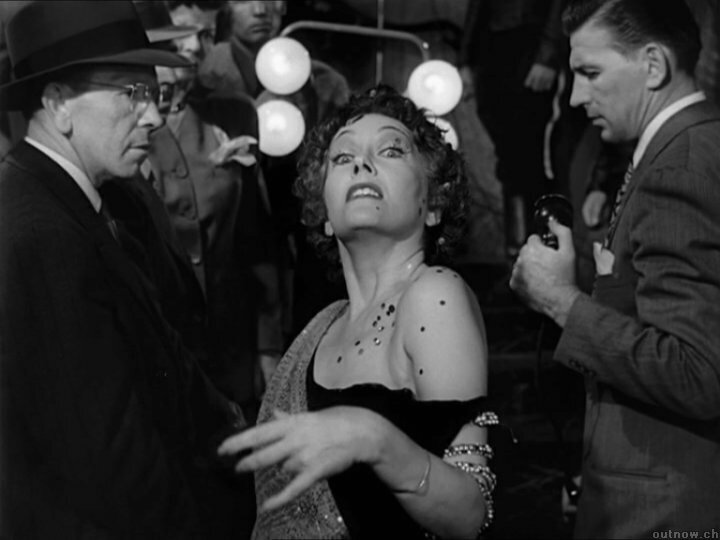 There are so many unforgettable, iconic moments in Sunset Boulevard I’ll mention my three favorites below. However, the most fascinating thing about this film is its insistence on depicting the true Hollywood – a story about the ultimate illusion that uses authenticity in many ways. I’ve mentioned the parallels between Gloria Swanson and Erich von Stroheim’s careers and the characters depicted in the film as one way truth and “make-believe” are blurred in the film. There are also many references throughout the film to real-life Hollywood stars, studio players and other films. Another is the use of three legends of silent cinema, all virtually forgotten by the time the film and its story take place, used in cameos playing Norma Desmond’s bridge-playing acquaintances. These are the “waxworks” as Joe Gillis refers to them, H. B. Warner, Anna Q. Nilsson and Buster Keaton, who got the part after Charlie Chaplin recommended him to Billy Wilder because Keaton was a great bridge player. Hedda Hopper, famed Hollywood columnist also plays herself in the film, reporting about Desmond’s downfall at the end. Brilliant scene. From casual conversation and admiration to a flash of madness, a moment of horror. The pose, the light and dark contrast, the mad face of the former star as she looks at her younger self, her former beauty. And the music, also reminiscent of music from a horror film, as she lowers her arm and turns her face back, toward the light to look at Joe Gillis. Perhaps a glimpse into her madness. Light and dark, all unnatural. What Gloria Swanson doesn’t mention in the introduction, which I had heard in a documentary about Sunset Boulevard, is that Queen Kelly was financed by Joseph Kennedy, father to future President, John F. Kennedy, and Swanson’s lover at the time. When she wanted out of the picture she called Kennedy and asked him to come out to Hollywood because a “mad man” was directing it. The story goes that there was a lot of bitterness between Swanson and von Stroheim after the demise of Queen Kelly but by the time Sunset Boulevard came to be, the bitterness was over and mutual respect, fostered by the years they’d worked together successfully, was the order. Another scene that just gets to me is the new years eve party Norma throws. She’d bought Joe the appropriate outfit, black tie and tails. He descends the stairs toward the grand room where Norma dances by herself to the music of the band she’s hired for the evening. The room is decorated for the occasion, there’s expensive Champaign, caviar, a full spread of fine eats. Gillis expects a party, with at least the waxworks in attendance. But no. It’s bizarre. A party of two and a very uncomfortable scene as one realizes the extent to which Ms. Desmond has gone in this fantasy. I am always amazed at how pathetic this scene is and how much I am affected by it. Although it is ridiculous, it is done so truthfully that this woman on that night doesn’t make me laugh. Instead I feel horribly sad for her. This is the scene that’s grotesque, unnatural, the one I want to turn away from. 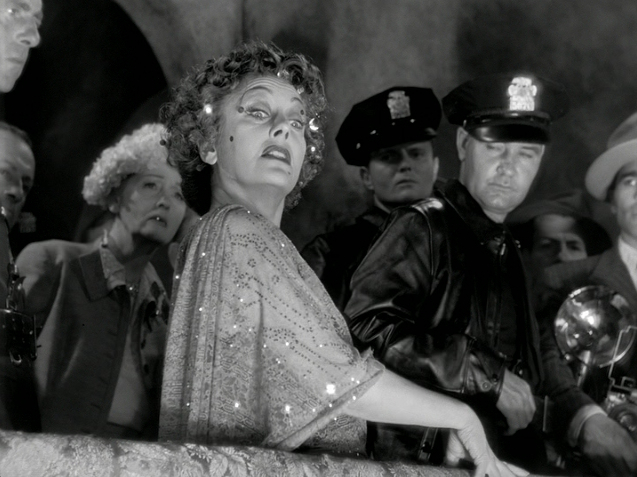 Impressive and memorable is the sequence in the film when Norma Desmond returns to Paramount Studios, which had to parallel Gloria Swanson’s return in some way and is poignant on that level alone. Then add the force that is Cecil B. DeMille, the director who Norma longs to reunite with in hopes he will direct her in Salome. This is a gorgeous sequence. Another that breaks my heart. The Paramount scene is great beyond all the wonderful trivia, however. I love that DeMille is so warm to Norma, coming out to meet her and greeting her as, “young fellow,” his real-life pet name for Gloria Swanson. DeMille apologizes to Norma for not having returned her calls. He makes sure she’s comfortable as he returns to work. Suddenly, Hawkeye, a crew member recognizes her and shines a bright light on Norma Desmond once more – if for a brief moment. Other cast and crew members surround her and we see, from above, she is adored in that place. The only place. 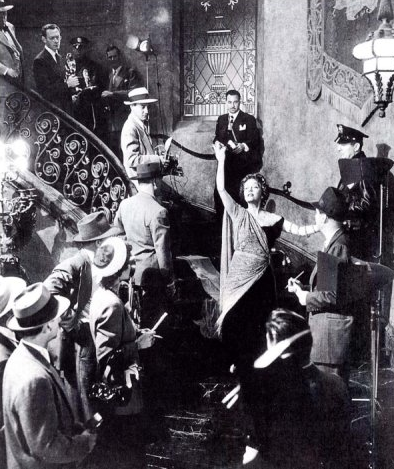 Her director gives her the cue and Norma Desmond walks down the grand stairs performing in what she believes to be her cherished Salome – the role that would return her to the silver screen, to her adoring fans. Surrounded by newsreel cameras, which she believes to be Cecil B. DeMille cameras she reaches the bottom, a brief look at Max, clearly heartbroken, sitting as a director would among the cameras. She does a dance of sorts. It’s creepy, over the top. But so sad…and unforgettable. 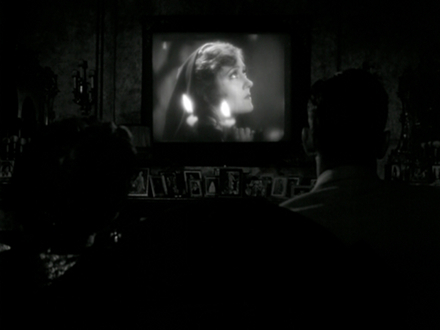 Norma drops the facade for a moment, becoming the actress wanting to please her director, long enough to say, “Alright, Mr. DeMille, I’m ready for my close-up.” She then picks it up again, the act. She becomes Salome. Toward the camera she starts to move, ever so slowly, dramatically, that face. FADE TO BLACK. My goodness. Of the numerous great Billy Wilder endings, the piece de resistance. 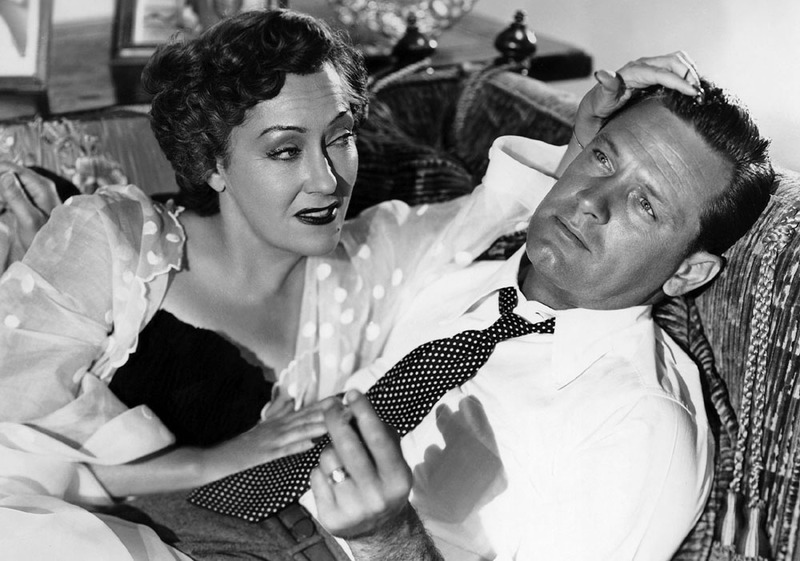 Sunset Boulevard was a bitter pill for Hollywood to swallow. One must recognize and pay homage to Paramount for making the film. I’m not sure if, even with Wilder’s reputation and weight, another studio would have made it. One thing the history of film shows is that the industry that sold dreams and fancy rarely pointed a finger at itself. Sunset Boulevard does that in spades. The reviews were mixed, some loved it, some hated it. 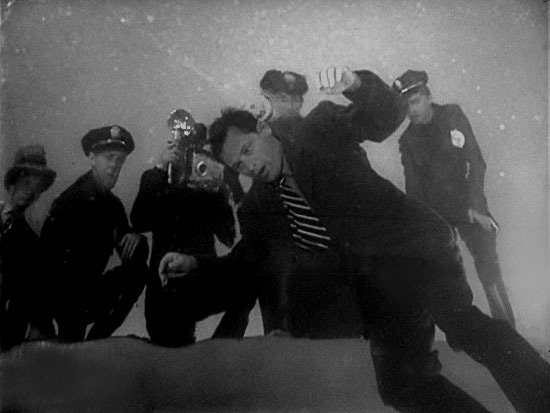 But Billy Wilder says he knew on the night of the premier that he had a sure-fire hit on his hands. He explains it was because the most important man in Hollywood hated the film. Louis B. Mayer came over to him full of insult about the fact that Wilder would dare portray Hollywood and the movie business in such a way, that it could lead to insanity. The nerve! Wilder quickly told Mr. Mayer off, amidst the complete shock of everyone that surrounded them, “as if I had bad-mouthed Queen Victoria.” He replied to the grandest of moguls, “I’m Billy Wilder and you can go f**k yourself.” And there you have it. Sunset Boulevard received 11 Academy Award nominations including Best Director, Best Actor and Actress in a Leading Role for William Holden and Gloria Swanson, Best Supporting Actor nods for Erich von Stroheim and Nancy Olson, Best Cinematography for the wonderful work of John F. Seitz and the coveted Best Picture, which it more than deserved in my opinion but I can’t complain too much since it lost to Joseph L. Mankiewicz’ great, All About Eve. Sunset won three statuettes, one each for Best Art Direction-Set Decoration, Black-and-White, Best Music, Scoring of a Dramatic or Comedy Picture and Best Writing, Story and Screenplay. 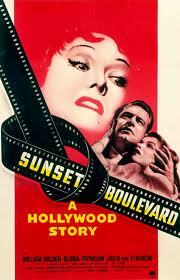 Many people refer to Sunset Boulevard as a film noir. To me it cannot be categorized so simply. If pressed, I’d have to defer to two descriptions of the film I enjoyed reading. Director, John Landis offers his view of the film as a “Gothic, horror, Hollywood soap opera, murder mystery. It’s wonderful.” New York Times Critics’ Picks called it “a classic meditation on celebrity and Hollywood.” I concur with both of those and add it is infinitely disturbing, absurdly humorous, tragically obscene, grotesque, gorgeous, pathetic. A masterpiece. I adore this film. Billy Wilder was already legendary by the time he made Sunset Blvd. He’d won an Academy Award for directing The Lost Weekend and had directed what many consider the greatest film noir ever made, Double Indemnity. He would also go on to make many other outstanding films. But what he did with Sunset Blvd. is special. I consider the fact that I am drawn in so instantly, so entirely into a story told by a dead man nothing short of a miracle. I never question the absurdity of that but am fascinated by it. The visuals, the sounds, the characters, and the story of Sunset Blvd. are timeless. It’s a film that must be seen. That’s why, to this day it is big, it’s other pictures that got small. 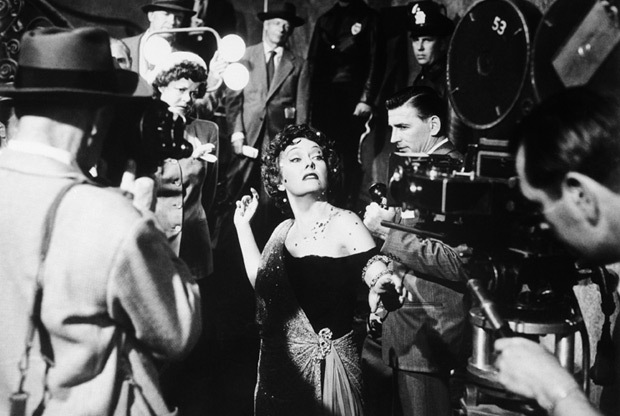 In 1989, the National Film Registry of the Library of Congress selected Sunset Boulevard as one of twenty-five landmark films of all time. In 1998, the American Film Institute selected this as the 12th greatest film of the 100 Greatest American Movies of All Time. Sunset Blvd. is just one film from Paramount Pictures’ astounding 100 years in film. But what a movie it is. I could think of no better example to choose in honor as one of my favorite parts (yes, there are more than what I discussed above) are the scenes in which the famous Paramount gates appear. 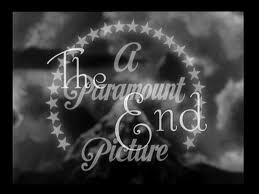 So with this post I extend a congratulations to Paramount Pictures on its centennial. 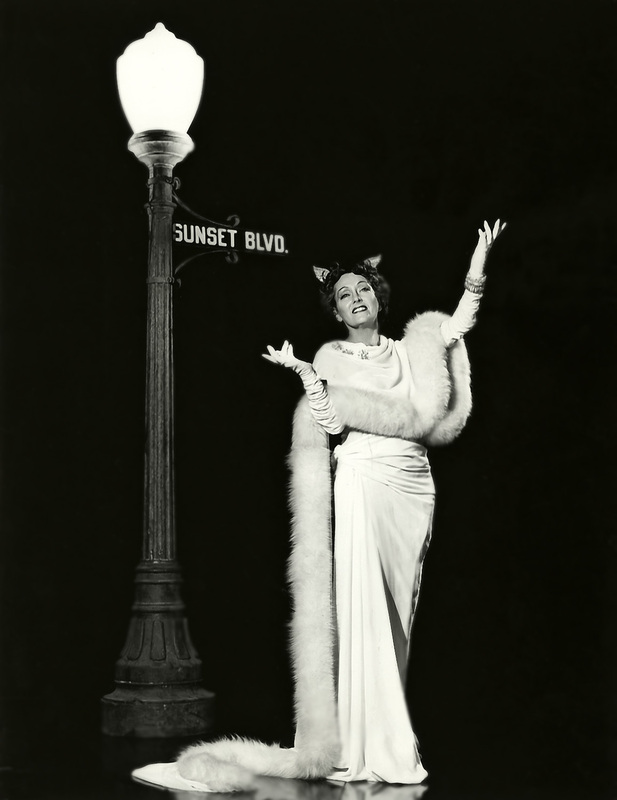 And from one of those “wonderful people out there in the dark” a “thank you” for Sunset Boulevard and all other boulevards – the ones of broken dreams, of laughter, of joy, tragedy and drama we’ve been privileged to visit for 100 years. 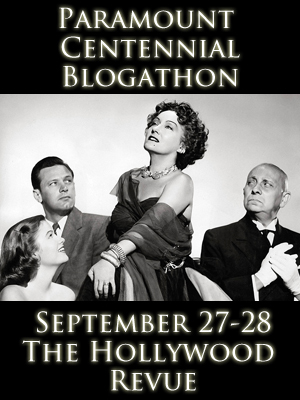 This post is my entry in the Paramount Centennial Blogathon hosted by The Hollywood Revue. I am submitting it quite late as I missed the deadline due to other obligations. Still, given my admiration of Sunset Boulevard and Paramount Studios I had to take part. And after all, Paramount celebrates its centennial all year. Please go to The Hollywood Revue to read the other fabulous write-ups submitted in celebration of Paramount Pictures. One last thing – a recommendation. Aside from hosting this great blogathon event, The Hollywood Revue went all-out in honoring Paramount with fabulous posts dedicated to its history and legacy. I am posting two of those here and urge you to take a look. They are informative and entertaining. Previous Thelma Ritter, WHAT A CHARACTER! Excellent post! 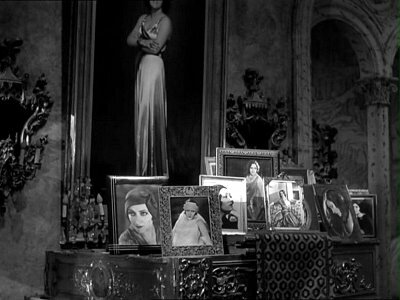 Sunset Boulevard is one of those movies that’s so hard to just do one post about because there is so much to say about it, but you did a fantastic job of covering so many important things in one post. You might be interested in reading Gloria’s autobiography “Swanson on Swanson.” It’s kind of long, but it’s full of so many excellent stories. She spends a lot of time talking about Queen Kelly and how it ended up being the disaster that it was. While she was talking about Sunset Boulevard, one little tidbit she mentioned that I had never heard before was that she personally designed the hat Norma wears when she goes to Paramount to see DeMille. She specifically wanted that feather on there because when she and DeMille worked together, he was really into having people wear feathers, so she wanted to give a little nod to that. I just have so much love for this movie. I’m glad I wasn’t an Academy voter the year this was nominated because I would have had a heck of a time choosing between Bette Davis and Gloria Swanson. I’m so glad you went ahead with this post anyway, because it’s fantastic! Thank you! Thanks so much, Angela! I’m glad you liked this because, in truth, I couldn’t focus through all the Sunset Blvd. fabulousness! I am adding the Swanson book to my must-read list. Shamefully, I know very little of silent film stars and outside of Sunset Blvd., nothing about Gloria. But, as I mentioned in the post, my interest was peeked as I watched her in interviews. So fascinating. If I were an Academy voter I would have gone for Swanson over Davis, I have to say. I adore All About Eve and Bette’s performance but this one is just beyond. And you’re right, I could very well rant and rave for many more posts on Sunset Blvd. alone. Wow!! Aurora, THIS is nothing short of fantastic. Don’t hate me Aurora, but can you believe I’ve never seen Sunset Blvd.? I’m ashamed to admit that, but I see now that I have to fix that, ASAP. 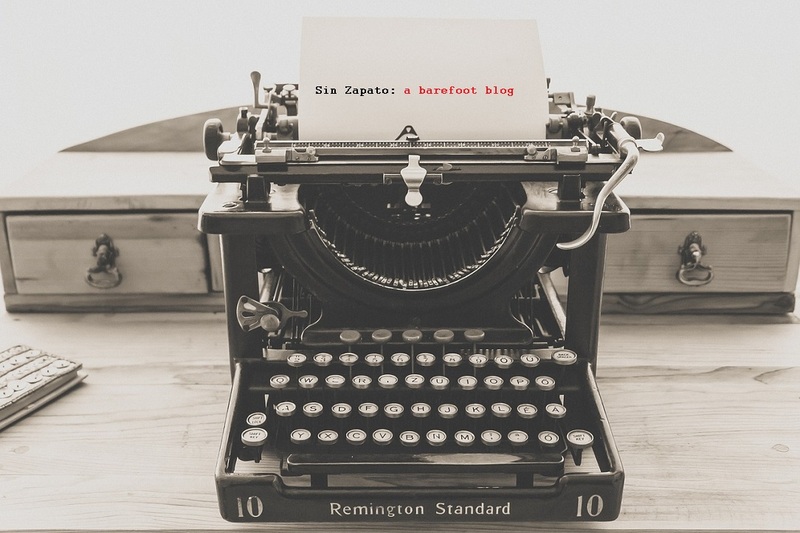 What a post….as always, I adore your writing style. You write with such passion, every single time!! I’m giving you a standing ovation right now…. Happy Friday Aurora! Thank you for this one. I promise to see it just as soon as I can. Oh, Sarah! How sweet are you! Your support is so great I actually don’t know what to say except, thank you again! I don’t hate you but YOU MUST see this film as soon as possible. THEN come back a comment on it or let me know in some way. If there’s ever a film must-see for classics fans this is it. I’m on it 🙂 I promise! Love, love, love your review! The New Year’s party scene always gets me too… Thanks for such a wonderful analysis of this movie. Thanks, Ruth! Means the world you like this. Such a great film…did I mention that? Brava! As insightful and fascinating as the film itself. A few years ago one of our local papers fired their veteran TV/movie writer and replaced him with a young woman who casually mentioned in an article that she must get around to seeing “Sunset Boulevard” one of these days. It was then I stopped my subscription to the paper. Wow! Means a lot you like this! This has to be one of my favorite posts because I was fascinated listening to Swanson interviews. Not to mention I adore Sunset Blvd. Thanks much for stopping in. AND love the fact you killed your subscription to that paper – anyone reviwing/discussing films for a living that hasn’t seen this film should not be allowed in such a position. SO THERE! I’m trying to find a photo of Holden in the morgue. I know I saw it somewhere on the web. Just came across your excellent piece.